I have a weak spot when it comes to breakfast. I love everything about it. Fruit, sausage, bacon, eggs, pancakes, waffles, muffins and doughnuts… the list could go on. So when I get the chance to make it for our little family, I always get really excited! 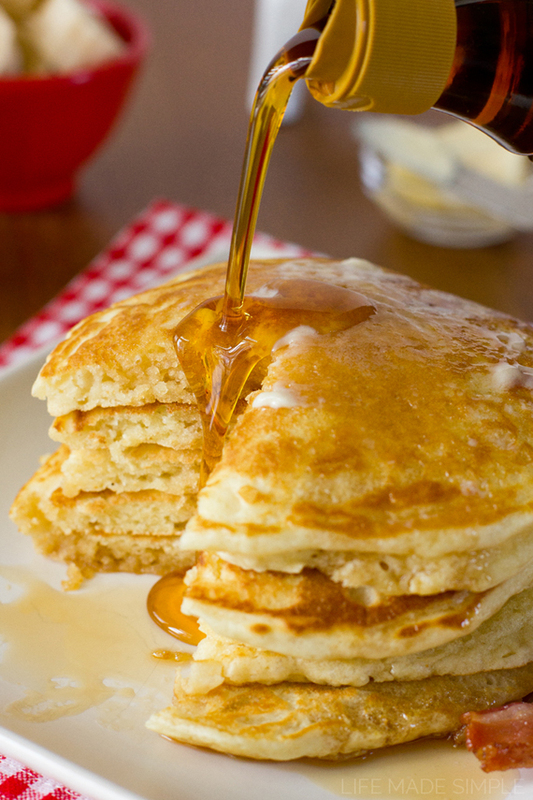 These buttermilk pancakes are my go-to recipe. They’re fluffy, soft and sweet. I absolutely LOVE them! Since we usually have fruit and bacon on the side, I usually make these without mixing anything in, but they’re great with blueberries, raspberries, chocolate chips or pieces of bacon. Today I’m going to share a few of my tips and tricks to making perfect pancakes. Let’s get started! First, place your pan (or turn your griddle) on to medium heat. Whisk the dry ingredients together in a medium size bowl. Whisking will ensure that the dry ingredients are combined which means you won’t be tempted to overmix the batter at the end. Next in a small bowl, combine the buttermilk, egg, melted butter and vanilla extract. Please (pretty please) DON’T substitute the buttermilk for a homemade version (milk + lemon juice or vinegar). They won’t taste the same! With that said, gently beat the mixture together, then slowly add to the dry ingredients (along with any mix-ins). Be very careful not to overdo it! 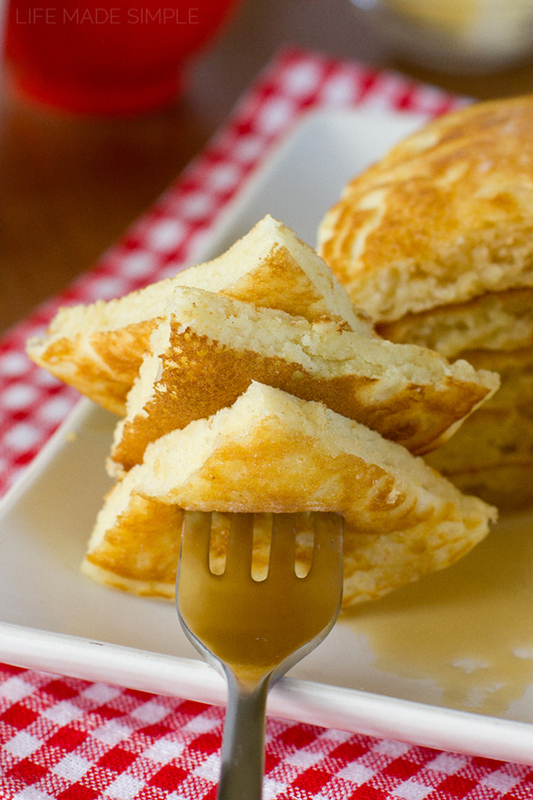 The key to soft and fluffy pancakes is a slightly lumpy batter. Sounds a little strange, but trust me, it’s true. At this point your batter is ready to go and your pan should be nice and hot. Add a small dollop of butter to the pan (about ½ tbsp.). Using ¼ c. measuring cup, scoop the batter and pour into the prepared pan. Depending on how big your pan is (or griddle), you can do a few at a time, just know that the batter will spread a bit. Cook for 2 minutes or until you see bubbles start to form on the surface of the pancake. Flip and cook for an additional minute. Your pancakes should be golden brown in color. If you like them a little darker, leave the pancakes on for another minute or two. Pile them high and serve with butter and maple syrup. They’ll be devoured in seconds! 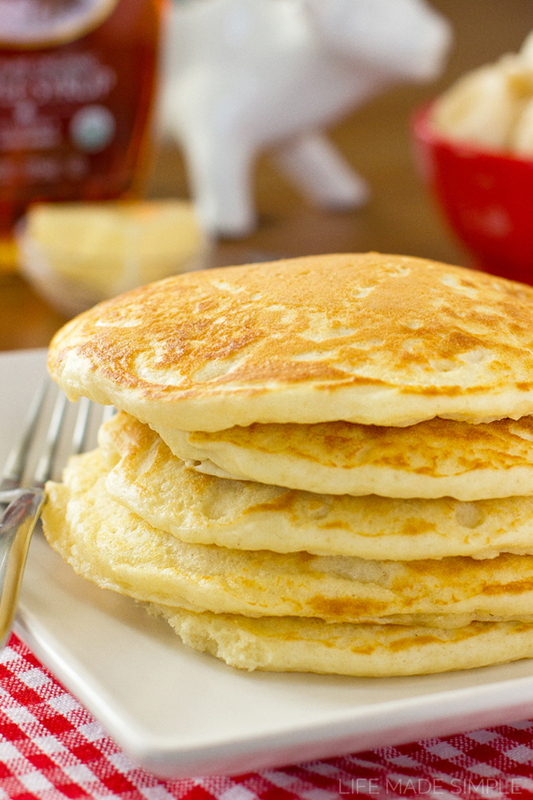 You won’t believe how easy and delicious these buttermilk pancakes are! I hope you’ll give them a try, they might just become a family favorite! 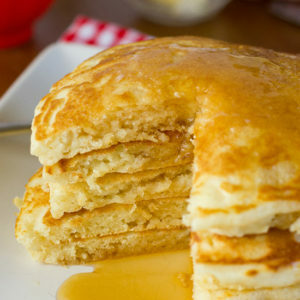 These are the BEST buttermilk pancakes! They're light, fluffy, and full of that sweet buttermilk flavor. 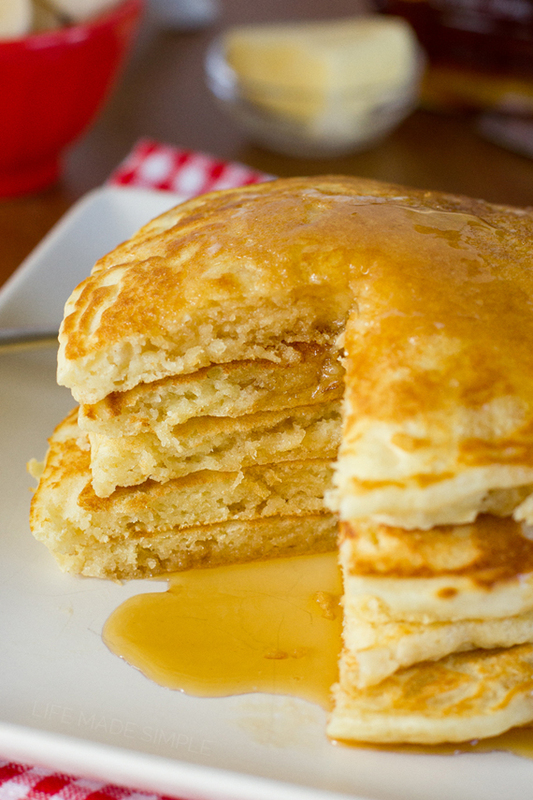 Pile 'em high and top them with butter and syrup! In a medium mixing bowl, whisk together the flour, sugar, baking powder, baking soda and salt. In a small mixing bowl, add the buttermilk, egg, melted butter and vanilla extract. Lightly beat until combined. Add the wet ingredients to the dry ingredients and mix until just combined, being sure to not overmix. Lumps make for fluffy pancakes! Place a pan over medium heat and add ½ tbsp. of butter. Scoop the batter out using ¼ measuring cup and pour into the center of the heated pan. Allow the pancakes to cook approximately 2 minute or until you see small bubbles on the surface of the pancake. Flip, and cook for 1 additional minute. The pancakes should be lightly golden brown in color. -For a healthier option, try substituting ½ c. of all-purpose flour for whole wheat flour. Adding 1-2 additional tablespoons of buttermilk might be necessary. -Blueberries, raspberries, chocolate chips or bacon can be added to the batter as the last and final step (before cooking them). I think there is a mistake in that you have more milk than flour(1 1/3 cup milk to 1 cup flour)? It made soup so I added more flour to try to salvage and it made these dense and weird. Hmmm… I’m not sure what the problem was. We’ve made this recipe several times and it has always turned out. Did you use actual buttermilk? Sometimes I like to let it sit for a few minutes before pouring the batter into the hot pan, that way the leavening agents have time to activate and it thickens up a bit. 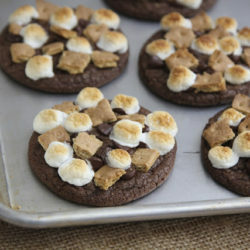 Made these this morning for the family and all of us enjoyed it very much!! Light, fluffy, and flavorful!!! 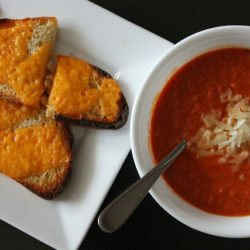 What sold me on trying this recipe (besides your gorgeous pics!) was how easy the recipe is. 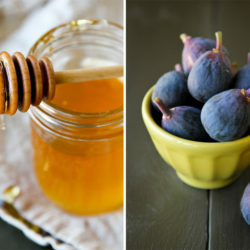 Who has time to fiddle with complicated recipes or ingredients non existent in the pantry. Nope this recipe is so simple for morning breakfasts with accessible ingredients…..PERFECT buttermilk pancakes, perfect morning!! Thanks for sharing!! This will be my new go to recipe. I wonder if I can use in our waffle maker….hmmmmmm.